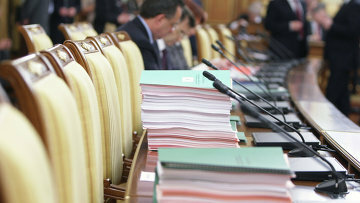 Bill on extension of government’s powers during procurement reaches State Duma | Russian Legal Information Agency (RAPSI). MOSCOW, September 6 (RAPSI) – A bill extending the powers of government in the sphere of state procurement contracts has reached the State Duma, the statement of the lower house of parliament reads on Wednesday. The bill allows the government to determine the lists of goods, works, services, leases (including freight and leasing). In addition, it may determine the initial and maximum price of a contract, setting limit beyond which customers can not conclude agreements without consent of the commission. If the bill is adopted, these lists will be established by separate governmental provisions. Authors of the bill note that value of shipbuilding products is expected to be set at limit of at least 2 million rubles (about $34,700) for construction of ships and 100 million rubles (about $1.7 million) for drilling platforms. The lower limit for aviation equipment is set at more than 1 billion rubles (about $17.3 million). According to the bill, government expects to extend the specifics of procurement in the sphere of investment projects to subsidiary companies in which the state owns more than 50% of the shares. If the company is going to implement investment projects worth more than 10 billion rubles ($173.9 million), purchases should be coordinated with the governmental commission. 12:53 06/09/2017 A bill extending the powers of government in the sphere of state procurement contracts has reached the State Duma.